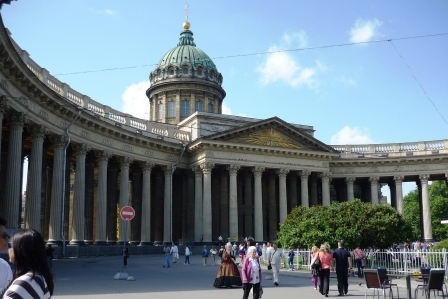 Day five – St. Petersburg (Monday): I had hoped to sleep in this morning to 8;30. At 8:00 Mom wakes me – she is half – dressed, but cannot get into the bathroom because she cannot make the light go on. She had not rremembered the notification last night that we would be electricity deprived until 10 AM. She said “Allyson, I am so dependent on you. I could not do anything without you”. I had mixed reactions to this. For a child, to have the parent declare dependence after a lifetime of having it the other way give a weird sense of justification. Alternatively, if it had not been for the dysfunction of the electic outage, she might well have managed quite well and her self-confidence would not have been further weakened; I was angry and gratified at once. But it is too beautiful outside not to share. After yesterday’s rain the morning is bright and sunny. 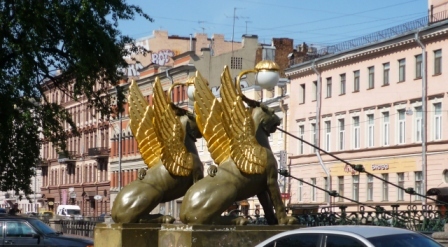 I get to the end of the block and there is a wonderful footbridge guarded by lions with gilded wings. Across the canal is the Cathedral of the Lady of Kazan. Down the canal is the Church on Spilled Blood, , its onion domes gleaming in the sun,twice as fantastic in bright sun as it already was under gray skies. I continue as far as the Cathedral, where I see a Russian Orthodox Mass in progress, sung in Latin with antiphonal chants, and a long queue of folks waiting to present their most fervent hope to the icon of Mary, which is supposed to have miraculous powers. Too fascinating. I turn back, roust Mom off the bed, drag her out to sunshine and spectacle. We see a costumed Catherine and Peter posing for photos. We see an expedition of scarved women believers on their way to present their cases to the Lady. 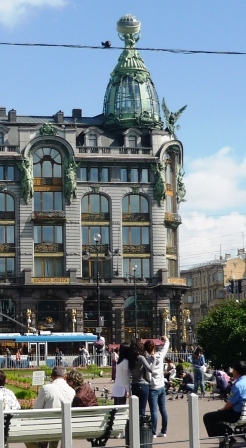 We see the Singer Building, an art deco extravaganza dating back to when sewing machines were an international status symbol, and beyond, the Church of Spilled Blood ever more fantastic as we approach. Finally we turn back. We may have reached the Post Office without knowing it, but we ware late for checkout at our hotel – would Davrila the friendly receptionist get in trouble? We hurry back, Mom nearly dehydrated by the time we arrive. I hump the 3 heavy suitcases and one zippered bag downstairs, we arrange for a taxi at 2 PM (“the English Embarkation Pier” is NOT sufficient address for a hotel which does not cater to cruise tourists! – tracking down its location took an extra 20 minutes of our break time). We make a last foray to the Gostiny Dvor for some last minute necessaries, and ice cream (chocolate chip and maple swirl make any day worthwhile!) . Our taxi driver did not speak any English, but he was guided by GPS to our port, and he was amused by my misadventures trying to take some last-minute photos – It never failed that as I was focusing on some equestrian statue, a giant tour bus would pull up next to us just as I pushed the trigger. – I have lots of gray pix with red stripes. Hi Allyson…I’m enjoying reading about your adventures. Reminds me of my travels to SPb. Hope all is well. ~Justin B.